Hi everyone! 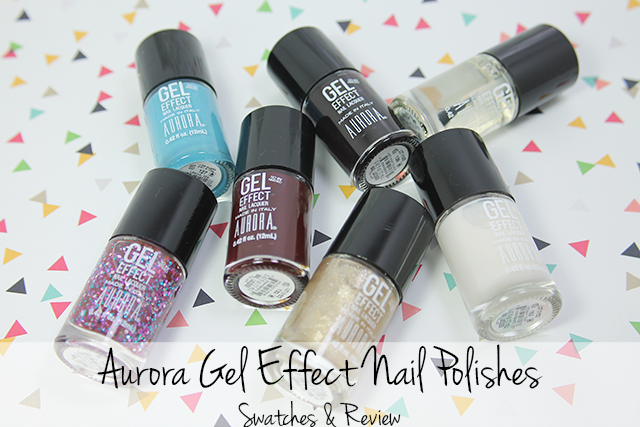 For today's post, I have some swatches and review from a new-to-me brand Aurora Gel Effect Nail Polishes. 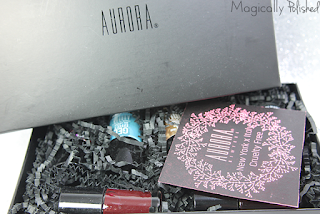 Aurora Cosmetics is a New York based Italian cosmetics company that offers a line of 5-free nail polishes. 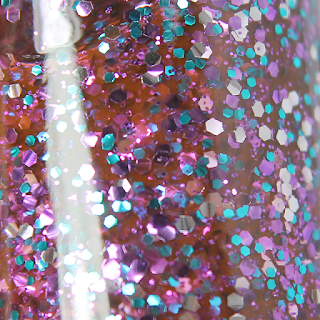 The gel effect polishes have an glossy finish that does not require a UV/LED light. Aurora Gel Effect Nail Polishes includes 59 polishes that range from cremes, metallics and glitter toppers. It also includes Gel Effect base and top coat that is supposed to extends the life of your manicure for up to 2 weeks, like a regular gel lacquer. Cream Tear- is beautiful milky off white creme. The formula on this polish was surprisingly good. Better than expected as these colors tend to be super sheer and need a million coats. However, this was surprisingly opaque in three coats, sealed with Aurora's Gel Effect Top Coat. 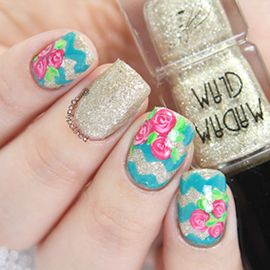 For this look, I wanted to add some really cute gold sicker designs, I received from Born Pretty Store. I even filled in the spaces with Aurora's That Kind of Rich. For some extra shine and longevity I applied Aurora's Gel Effect Top Coat. That Kind of Rich- is a gold shimmery polish. 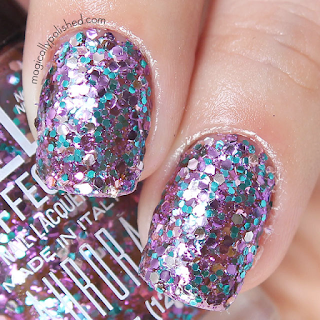 The formula on this polish was very good and applied smoothly onto the nails. The color on this polish was perfect and bonus as gel effect polish. This is two coats sealed with Aurora's Gel Effect Top Coat. 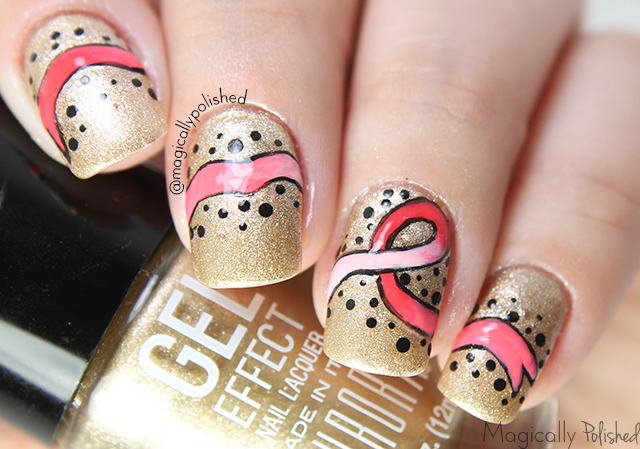 Since it's October, it is definitely time for those Breast Cancer Awareness manis. This awareness is very important to me, since most of my female family members were/are diagnosed with breast cancer. So for this look I wanted to create a floating ribbon, with some gradient pink.Then sealed with Aurora's Gel Effect Top Coat. Psychd Fuchsia- is a gorgeous oxblood red creme. This polish is definitely a favorite of mine and the perfect color for the season. Application and formula was super smooth and amazing to apply. This is two coats sealed with Aurora's Gel Effect Top Coat. For this look, I thought Psychd Fuchsia and That Kind of Rich will be the perfect combo. So I decided to create a ruffian look and then accent it with Hex Nail Design bow charm. Last Night Black- I was a bit confused with this shade. It looks black, a dark brown or a shade of dark purple. It depends on how you look at it. However, I wasn't surprise by the formula and application. 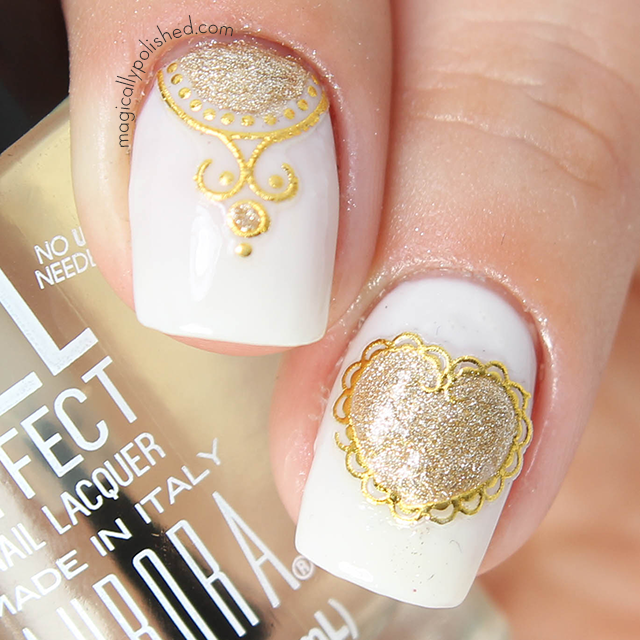 It was smooth and applied perfectly in one coat, sealed with Aurora's Gel Effect Top Coat. sealed with Aurora's Gel Effect Top Coat. Lanikai Sea- is a vibrant blue shade,truly reminds me of the sea and another favorite of mine! Application and formula was super smooth and amazing to apply. This is two coats sealed with Aurora's Gel Effect Top Coat. 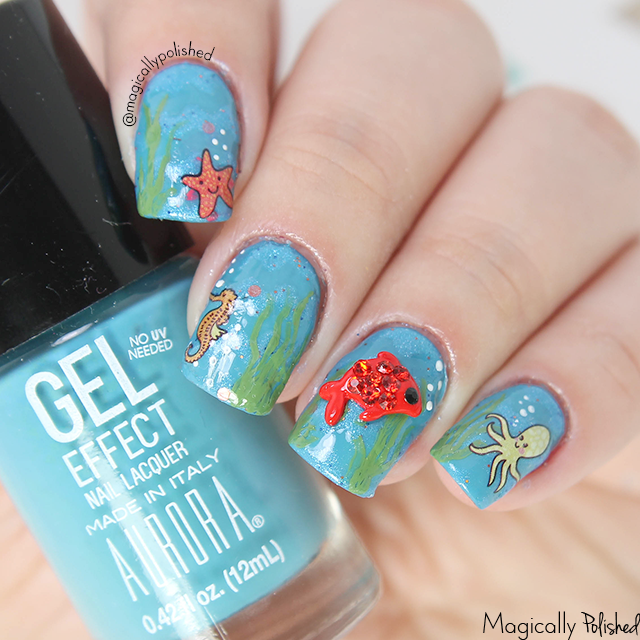 Of-course I had to create an under the sea theme nails. I actually created this design I last year when I participated a guest blog post. I loved it so much, I thought why not update it. 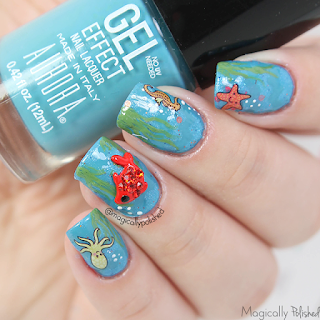 I used Lanikai Sea as the base and a glitter polish (that matched perfectly). 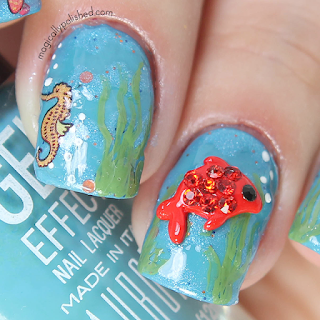 I used some wave vinyls on the nails and added some seaweed and Daily Charme In The Sea water decals and fish charm. YouTube: Aurora Cosmetics Hope all of you enjoyed my post today! What do you guys think? Let me know in the comments below!